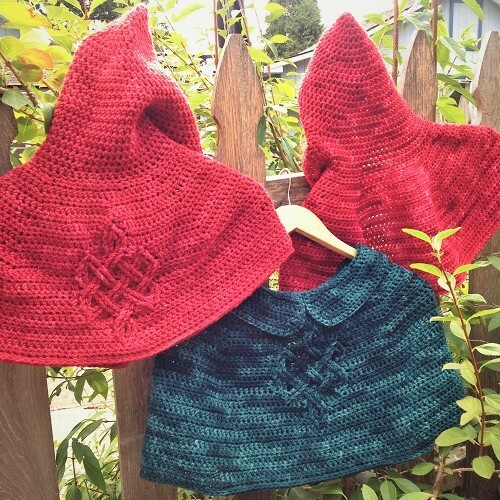 ReCrochetions: Cadha's Celtic Capelet - New Pattern! Cadha's Celtic Capelet - New Pattern! Designed for Ficstitches Yarns Crochet Kit Club #2. 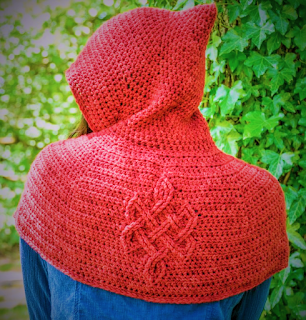 A red hood was one of the first designs we discussed when C. Jane Reid and I began brainstorming story and design ideas for the Ficstitches Yarns Kit Clubs. She spoke of creatures, animals who don't act quite like animals... "like the wolf in Red Riding Hood." The stories have changed as she develops them further, but the idea of a "red hood" stayed with me. A modern interpretation of the short traveling cape worn by Grahame's aunt in Part 2 of our story, Cadha's Celtic Capelet is worked in one continuous piece of half double crochets in worsted weight yarn, from the point of the hood down to the bottom edge. Inspired by the Celtic Knotwork of Cadha’s homeland, the Eternal Knot cable pattern on the back has no beginning or end, connecting one’s destiny bound by time and change, just as Ailee and Grahame discover their own destinies and how they are intertwined. Representing the interweaving and ever-changing spiritual path, the Eternal Knot expresses boundless wisdom and compassion. The Trinity Knot used for the button loop is another endless knot pattern, originally designed to represent the Mother, Maiden and Crone. This seems particularly appropriate as Ailee is learning her way from Cadha. 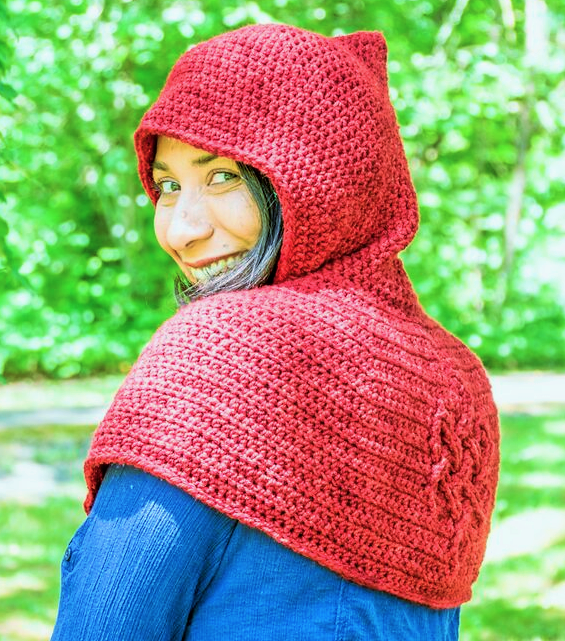 As Ailee hopes to learn to make her own capelet, without the complex cablework, I wanted to include three variations for this patterns to adapt to crocheters of all experience levels. One can choose between a capelet with a hood, an easier version without the cable, or a collar rather than a hood. Cadha's Celtic Capelet is now available for purchase on Ravelry. Be sure to check out all the other goodies that were included in Kit Club #2. And don't miss the chance to Preorder your very own Kit Club #3 in the month of October! Top 2 pics ©Guy Holtzman, my awesome new brother in law and photographer. We plan to get more model shots soon, once we've all recovered from their wedding last week, which I crocheted the dress for.